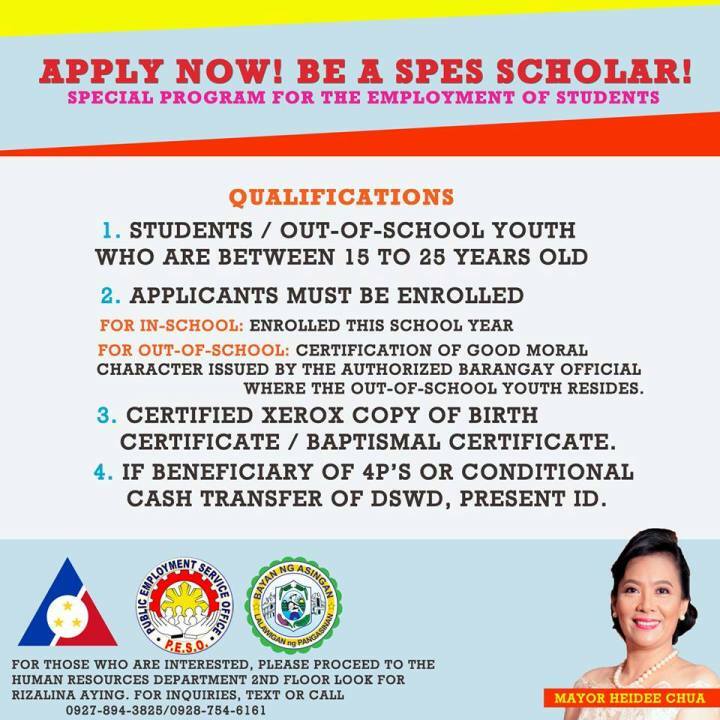 The Local Government Unit of Asingan thru the office of Mayor Heidee Chua is now hiring Interns under the Special Program for the Employment of Students (SPES) in cooperation with the Department of Labor and Employment (DOLE) and PESO Asingan. Registration Form (SPES Form 2). Certified Xerox copy of Birth Certificate/Baptismal Certificate. Certification of Good Moral Character issued by the Authorized Barangay Official where the Out-of-School Youth resides. If beneficiary of Pantawid Pamilyang Pilipino Program or Conditional Cash Transfer of the Department of Social Welfare and Development (DSWD), present ID. For those who are interested, please proceed to the Human Resources Department 2nd Floor look for Rizalina C. Aying. For inquiries, text or call 0927-894-3825/0928-754-6161.